West coast. Is this Angolan? The dark spots look a bit like the reticulated subspecies. 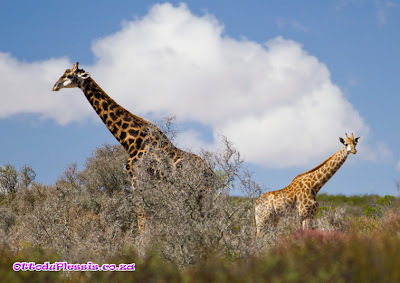 Hi Jerry, I finally got an answer for you about the dark spots of these giraffes. The males get darker as they age. If they are quite old, like 30+ years, then they can have these dark spots. It also depends on which areas they roam and of course the vegetation. Waar presies het jy hulle gekry? Hierdie foto is geneem by Buffelsfontein wildsplaas naby Yzerfontein. Hi Jerry, I'm not too sure but we also picked up that those spots are quite dark, even on some of the other giraffes of which I haven't posted pics. I'll do my best to find out from where they are. This was taken at the west coast of South Africa, near Cape Town.